We are all busy people or at least we think we live busy lives; and statistically speaking, the majority of us are in fact sleep-deprived. There is only so many waking hours in a day and maximizing the time we have becomes an ongoing battle inside our minds and in our calendars. In a city like Shanghai where work never ends, the drinking and dining scene thrives, it’s incredibly attractive to just go out for a nice delicious meal to ease into the night, or to just pick up the phone to order some cheap and yummy food delivery and watch some tv shows. After all, this is what Shanghai is good for! I, for one really enjoy dining in Shanghai. There are so many options of different cuisines and there are a lot of really good restaurants out there. But as the title of this blog post suggests, I’d like to re-discover the timeless craft of cooking. It feels like cooking is falling out of favour, especially with the younger generations and with all the food delivery services and affordable dining options available in Shanghai, I’m afraid this perennial tradition may be lost one day. It is not only important for cultures and tradition that we hold on to this activity that brings families and friends together but it is also critical to our own vitality and health. When we cook for ourselves we can control exactly what ingredients to use. Although, buying safe and healthy groceries can seem like a chore, there are sources out there that are safer than others. Buying meat from reputable brands like NPG chicken and grass-fed beef from the butcher shop goes a long way to getting the healthiest ingredients in your kitchen. You also have complete control in using the proper cooking oils as 99% of restaurants will no doubt be using the cheapest vegetable oils they can buy. These vegetable oils are extremely toxic to you and you should definitely read about that in my future blog on toxic oils! Then, preparing the ingredients and actually cooking can be quite a therapeutic experience. There are fundamentals that you will need to learn like knife skills so you don’t cut your finger off and choosing the right cooking method for the dish you are making (ie. pan-frying a steak, or steaming broccoli). These skills will come in time and you shouldn’t feel like a loser just because you don’t know how to do it. Like any life skill, it will take time to become adept but that’s part of the journey and part of the fun! 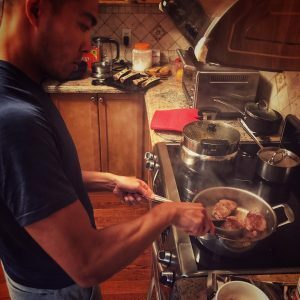 At one point, you may even find yourself completely involved in the act of cooking that you may find yourself in the flow (there are many studies that say we are at our happiest when in the flow!). This is the first of a series of blog posts and media posts on my newest topic: In Praise Of Cooking. Its mission as stated above, is to inspire you to take up cooking, be inquisitive and take a keen interest in how food is prepared and cooked. Of course you’d be an advocate for cooking! Hope you’re doing well!